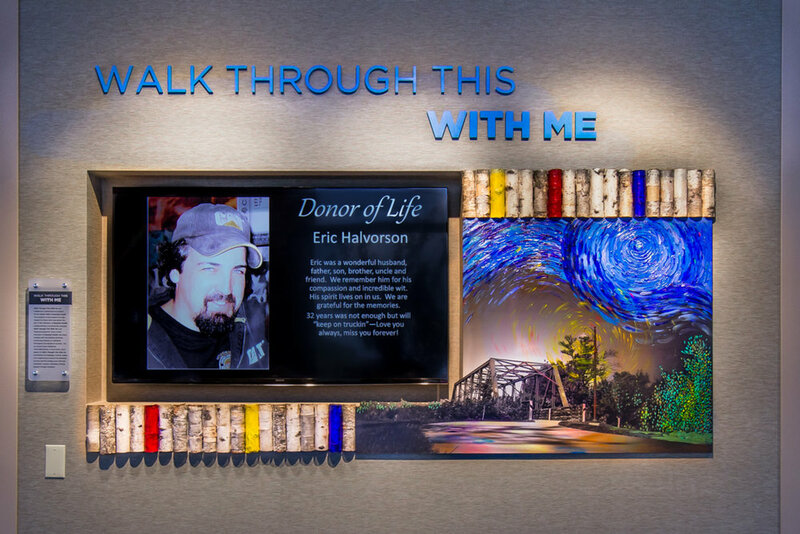 'Walk Through This With Me' is a permanent art piece created for Essentia Health Hospital. This mixed media work is the official Donor Wall for the hospital - representing and commemorating the friends and family who have been involved with the donation process. "This idea bonds the monitor and the artwork into one cohesive body. Individual birch logs will be cut in half. These small logs will be lined up side-by-side. Their unity symbolizes the superior strength a support team can provide. This reflects the strength and bonds that form during the trying time of organ donation. As seen, I have three logs in each row painted a primary color. This signifies the reliance we have on our foundation – our organs. The black and white photograph of the bridge symbolizes the passage of life. The bridge itself is a very unique artistic element. It is physically cut-out on its left side, framing the TV. The framing of the TV by the bridge will demonstrate the unparalleled strength that is instilled in all those affected by organ donation." By examining site-specificity, intervention, and infiltration, Beauchene produced three works of art specifically for his solo exhibition, Square Footage. Two works, 2400 Virginia Ave NW Apt. C1010 and Open House: $1,350,000, from Beauchene's exhibition were selected to be a part of ACADEMY. This exhibition was the 14th annual invitational survey hosted by Connersmtih Contemporary of outstanding work by MFA/BFA students in the Washington/Baltimore area. The projected video displays an infiltration of a 1.35 million dollar home in Washington, D.C. during an open house hosted by the realtor. Beauchene occupied the open house for three hours while it was open to the public. Exercising, shaving, and napping are just a few actions that Beauchene executed during this short span of time while this private residence was temporarily transformed into a public space. Open House: $1,350,000 earned Beauchene a First-Place Award at The Annual Juried Art Show at The George Washington University, Washington D.C.
Beauchene was accepted to exhibit at (e)merge international art fair located in Washington D.C. by the following vetting committee: Ai Weiwei, Mika Yoshitake, and Jeffreen M. Hayes. The photographic documentation of Pancake Feed captures a performance by Beauchene. A grounded f-3 tornado was two miles away from Beauchene during this performance. He and his wife (photographer) managed to flee the scene unharmed. The (e)merge art fair connects emerging art professionals from around the globe with collectors, curators and cultural decision makers in Washington, D.C.
MK Homeless Shelter - Washington, D.C.
-Travis Beauchene, director of gallery 102, Washington D.C.
MK Studio: Dignity | Belonging | Change was an exhibition conceptualized and curated by Beauchene. he spent three months volunteering at MK homeless shelter's art therapy twice-a-day sessions. During his time spent developing relationships with the residents, it was made apparent that there was a need to display their artwork in the public sphere. This prompted Beauchene to create an exhibition showcasing their work. STUDIO THREE BEAU's largest painting to-date, this 210 foot mural, spans the entire perimeter of Halberstadt's in West Acres Mall. It utilizes a black and white palette and combines multiple views of the Fargo-Moorhead Skyline. Beauchene used latex paint on sheets of insulation board.